Today I'm brewing my house Saison again with a few tweaks. This time I'm going to ferment the beer with a clean yeast and add some brettanomyces and maybe lactobacillus in the secondary. My last version, you can find brew day here and the tasting notes here, is still evolving in the bottle. I'm happy with how it turned out but I feel it's more of a Wild Ale than a Saison. I will change up some of the process and see if I can tweak it to fit the beer I am imagining. I take a lot of inspiration from some of my favorite breweries on this beer. Tired Hands SaisonHands is one of the most fantastic beers I've ever had. They use four grains in their recipe so I decided I wanted to go that route as well. I will have some rotation in what exact grains and what hops I use until I nail what I'm looking for. I'm also inspired by Casey Brewing and Blending as well as Hill Farmstead. Both of those breweries release fantastic Saison and Farmhouse style beers. I know Shaun isn't keen on using the Saison name but his Farmstead Ales are things of pure magic. The previous Kathleen used dregs grown from Anna and Arthur with Wyeast 3726. I still have that culture saved but I believe adding it to secondary will yield better results. Maybe I can use that and the Emptiness culture from Tired Hands that Daniel from In Search of Saison was kind enough to send in secondary down the road. So many possibilities! I've actually been struggling with what brettanomyces strains I'm wanting to use in my beers. I guess it will just take more brewing! You'll notice I changed to the Pilsen malt this time instead of the Pale Ale from Dingmans. I'll be using this for pretty much all my pale beers going forward. The Pale Ale malt is great but leaves a bit too much sweetness for me. It will be great for any darker or amber beers I think. I also removed the Vienna and added in a small portion of rye malt. I thought about switching wheat out for some spelt but I can do that in the next brew. Then I changed the hop schedule to something more classic instead of a single bittering addition of the Aramis hops. Amarillo is a perfect finishing hops for something like what I'm trying to do. We'll see how it plays with the yeast and malt bill in time. The day before I made a 1200mL starter and pitched in the fresh vial of East Coast Labs ECY-08. I've been wanting to work with this blend for a while now so I was excited when I saw it available. 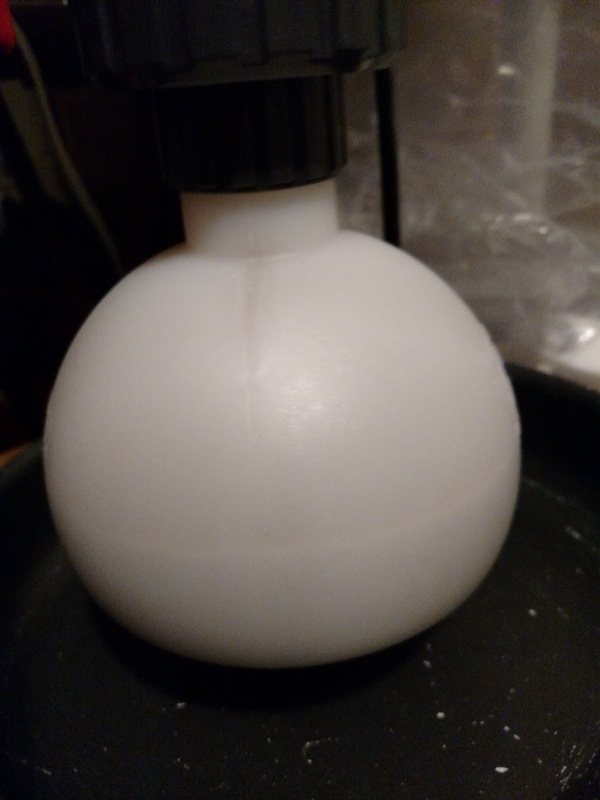 I plan on keeping it around so I left about 200mL in the flask to build up and store. If I like the results, I'll have some available to use again. FastFerment assembled and ready to go! I went to my LHBS last week to pick up a few more Better Bottles. I was informed that they had halted production and didn't know when they were going to fire back up. I looked around a bit and saw the FastFerment from the guys at FastRack. I had heard about these but hadn't heard much about the performance. I scooped it up and decided I would give it a go. In the mean time I'll be ordering some Vintage Shop PET carboys. I'm really needing to pick up some more with all the beer I have going right now. I soaked all the smaller parts in PBW then gave them a rinse. 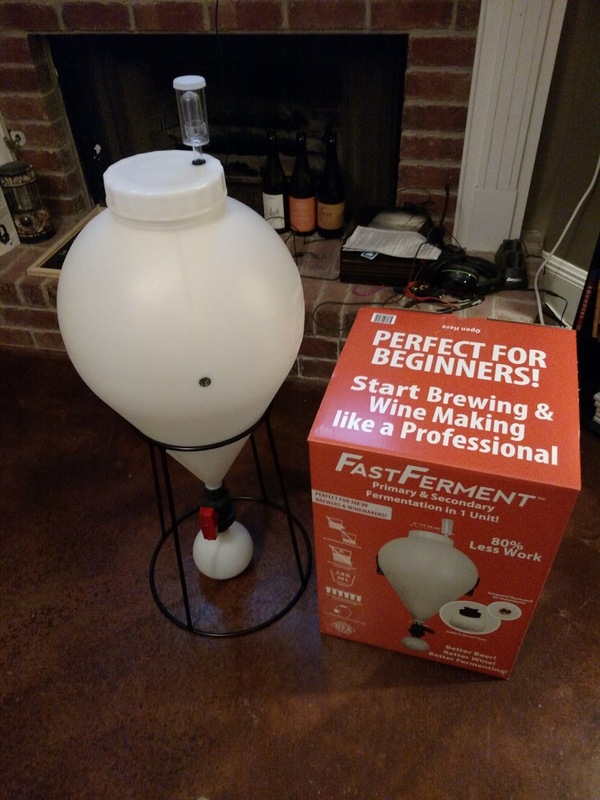 Assembly of the FastFerment is really easy and intuitive. I didn't find any leaks after I had it together so I then filled it with a PBW solution. After the soak I drained the PBW and kept it for cleaning after my brew day. Then I filled the conical with a StarSan solution to sanitize. Brew day went great. I still ground my grain the same as last time on Batch 3, but I didn't add the grain until after the water this time. I didn't run into the clog or stuck mash so that was great. My mash temp stuck around 150-151F for the entire hour and then I cranked it up to 166F for my mashout. I shot for 168F but just didn't reach it. It took about 45 min to fly sparge and collect my 9.5 gallons for the boil. Got to drink Saison while brewing Saison! Great beer from Kane. A tad sweet for me but super refreshing! 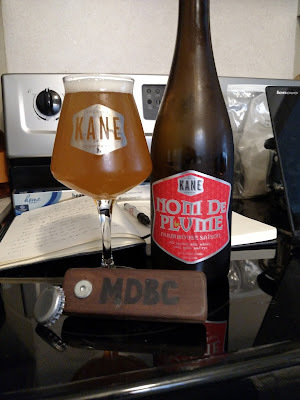 Check out Nom De Plume. After the 90 minute boil I checked the gravity and saw that I had hit my target starting gravity of 1.048. With the use of Saison yeast and the brettanomyces yeast I usually add, this will dry out and produce a beer in my target range of 5.5-6.5% ABV. I want it to be an easy drinker but also be a base beer for blending, barrel aging, adding fruit and souring as well. I pumped the wort through my heat exchanger and into the conical. I pitched my starter and set it in the edge of the kitchen where the ambient temps will stick around 86-72F for the next few weeks. I'll have a heater on hand in case it's needed. In it's temporary home for a couple weeks. I've heard some things that the FastFerment can be hard to clean. I haven't gotten to that stage yet but I"m not sure I see how it will be difficult. Remove the bulb and give it a good spray then re-assemble and let some PBW or something else soak and clean it. I'll report back on that when the time comes. After this beer finishes I'll be bottling some clean then transferring the other to secondary with a few brettanomyces strains. I recently acquired ECY-04 Brett Anomala and ECY-30 Brett Naardenensis from East Coast Yeasts so maybe one of those will go in the running. I also have a Lochristi Blend from The Yeast Bay I need to use. I may throw that on a low rpm stir plate to build it up while the beer is in primary then add that in. SO many choices now days! I'll post back with updates and eventually tasting notes of the clean portion and the portion I secondary with brettanomyces. 11-22-15: 6 hours after pitching the active starter. No oxygenation after transferring to the conical. Saison yeasts are beasts! 11-25-15: Used a space heater to keep the conical above 75F. It has been averaging 78-80F and fermentation is still steady. 11-27-15: It looks like fermentation is coming to a halt. I'll let it sit a few more days and then take a gravity measurement before moving forward. 11-30-15: Everything seems to be settling out now. I took this picture of the bulb on the bottom of the FastFerment. I whirlpool after boiling for about 10 minutes and I also use a stainless steel hop spider. The yeast cake looks clean and seems to be settling well. This FastFerment may just be the ticket for easy re-pitches of the yeast. I'll let it sit for a little while longer and then transfer some to be bottled and the other I'll add some brettanomyces and maybe an oak spiral to. That line about 1 1/2 inches from the bottom is the yeast cake forming. 12-20-15: Gravity reached 1.002 after checking twice to confirm stable. I bottled one gallon of this clean and then blended the remaining four gallons with a sixteen month old Lambic style blonde sour. Results of the blend were very fruity with a slight tartness and funk. I think the sour blonde really complimented the Saison well. Tasting notes to follow after carbonation! 2-18-15: Tasting notes posted here. I'll say it again, can't wait to start homebrewing and messing around with saisons! Have you had Jonquilles? Would love to be able to homebrew something like that! Absolutely love that beer. I was fortunate enough to have it not long ago. I will definitely work towards something like that in the future.